Splat the Cat: What Was That? on TheBookSeekers. 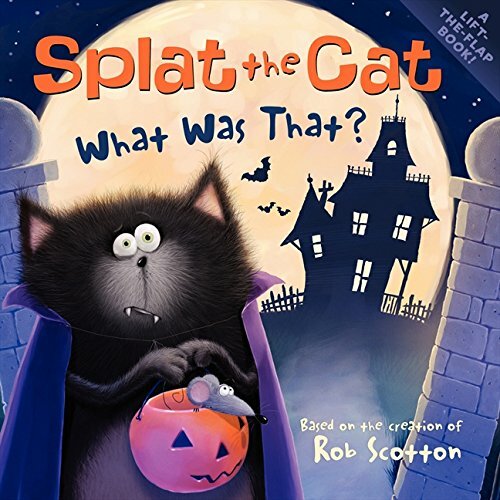 Splat the Cat and his friends have a Halloween adventure in Splat the Cat: What Was That?, a lift-the-flap book by Rob Scotton, creator of the beloved Russell the Sheep.Halloween should be a black cats favorite holiday, but Spat the Cat is nervous about visiting a creepy haunted house. Hes worried it will be too scary. Splats friend Spike tells Splat not to be a scaredy-catthe haunted house is just for fun!Splat and Spikes visit to the haunted house turns into a rescue mission when Splats pet mouse, Seymour, gets lost inside.Kids will relate to Splats apprehension about visiting a haunted house and theyll enjoy the exciting surprises under every flap in the funny, spooky book.